ROCKSBOX. TREASURES YOU CAN WEAR. I've come across a really fun service that offers subscription services that provide jewelry to your door each month. As you will see, there have been some changes made to my website. This is an evolution so my tabs are reflecting the evolution and the work will take days to complete. Pay attention so that you won't miss something. ​Need to simplify your life? Most of our busy lives can use simplifying. Since I first saw the advertisement for FAB FIT FUN, (long, long ago), I dreamed of being a partner. However, at the time, I was still sick with Lyme disease and trying hard to get a grip on life and was not far enough along with social media to become an influencer, never mind chasing my other dreams. 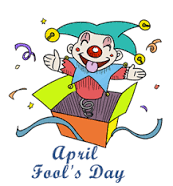 Happy April Fools Day! The best of the day.